Liberty Lift manufactures a broad product offering of artificial lift systems for better oil and natural gas production. Our management team has more than a century of experience in the industry, and Liberty’s products are supported by the best field professionals that oil & gas has to offer. Our new Bakersfield facility provides the support you need, when you need it. Liberty Lift is continually advancing artificial lift technology and developing cutting edge products to outperform our competition during every phase of a well’s lifespan. Liberty Lift’s stimulation and lifting solutions are designed with proven iron, proven concepts and proven support. Our extensive product line is built to exceed API 11E standards, and proudly carries the API monogram. From reliable, iconic beam pumping units to leading edge gas lifting options, Liberty Lift can help customers apply pressure just where it is needed. Our technologies are laden with features that allow for maximum durability and ease of use, allowing oil and gas companies to utilize their valuable manpower where it is needed most. And speaking of manpower, our support professionals are always where they are needed, day or night. Pressure is the watchword when it comes to well management. Too much and it’s a kick, potentially a blowout. Too little, and those precious hydrocarbons never make their way to the surface. Liberty Lift is an expert at solving the latter problem, using the most advanced artificial lift systems available to oil & gas. Virtually every single well will eventually need some form of artificial lift, and the overwhelming majority, as in more than 95 percent, require it from the very outset. Even when pressure conditions are optimal inside the well, they won’t remain that way forever. This is where Liberty Lift comes in. We specialize in the design, manufacturing, installation and optimization of oil and natural gas lifting systems. Liberty Lift’s pumping units are field proven and in operation throughout all U.S. drilling regions. That includes our beam pumping units, our hydraulic jet pump units, our gas lifting systems and our XL Long Stroke units, which are an excellent alternative to standard ESPs. At Liberty Lift, our goal is to maximize every client’s output and efficiency. Our technologies make that goal a reality. Liberty Lift designs and manufactures leading edge artificial lift systems, made to fit any extraction application. Shallow wells, deep wells, deviated wells, horizontal wells, low flow or high flow – Liberty Lift has a pumping unit for every situation. Our products utilize proven designs while iterating on them, with a team of engineers dedicated to getting every last bit of efficiency and reliability out of the technology. If low well pressure is the problem, Liberty Lift has the people and the iron to produce the perfect solution. Liberty Lift’s engineered products and extensive industry experience are what we’re known for, but our service team is one of the most versatile in the business, and deserves recognition. Support personnel operate out of several service centers, located in major U.S. drilling regions. Here, our team can perform a comprehensive array of tasks, including repair, testing and fabrication or machining. Liberty Lift can repair or produce nearly any component for its oil and gas lift systems, ensuring our clients can manage their well production as optimally as possible. Our service team is also equipped for most field services, including preventative maintenance inspections, component or unit installation, rod replacement and system optimization, among other services. And, of course, this level of service is made possible with a bottomless inventory, with new and reconditioned beam pumping units, mandrels, valves, concrete bases, motors and hydraulic jet pump units and parts available when needed. Getting all of that material to the well is no obstacle, either, as Liberty Lift can provide cranes and trucks for its clients. Liberty Lift, then, isn’t just an equipment seller. It is a fully-involved partner that manages its solutions after providing them. Liberty is a top manufacturer of top quality artificial lift technology, and we manage every part of the production process, from design, to engineering, to construction. 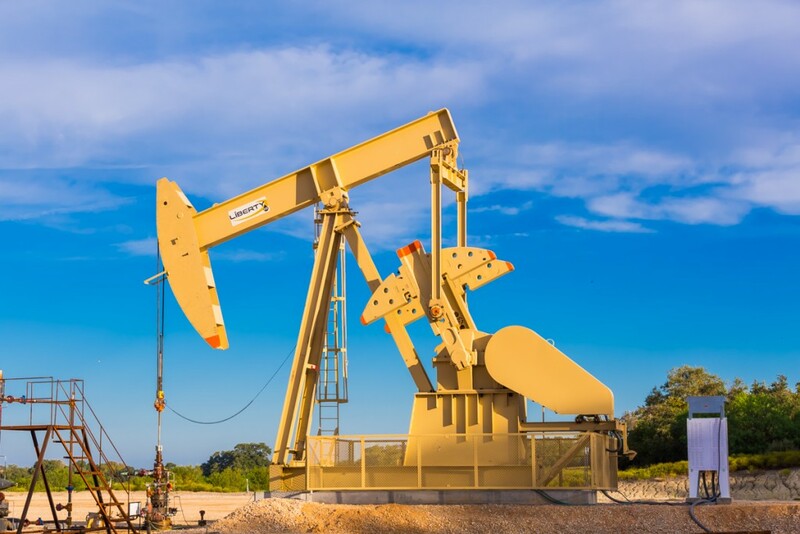 Liberty Lift develops a variety of oil and natural gas lift systems, including instantly recognizable beam pumping technology, hydraulic jet pumps, gas lift systems and long stroke units. All of our pumping technologies are drawn up by our engineers and meet API 11E standards, as well as other API specifications. And because Liberty Lift can perform a full range of support services, including component fabrication, we can keep our pump units operating at maximum efficiency, all the time. Other than the gusher, no single image captures oil & gas like the reliable beam pump. And Liberty Lift offers a pair of beam pumping designs, built for maximum efficiency and working capability. Our beam pumping systems are designed, manufactured and installed by Liberty Lift engineers and support professionals. We adhere to API 11E specifications and API quality standards, too, so every Liberty Lift beam pump is a feat of engineering. And with 30 years of experience backing the design and construction of our beam pumps, quality engineering is expected. Liberty Lift’s beam pumping units include its High Efficiency (HE) and Enhanced Geometry (EG) models. The HE is built with 186 degrees of crank rotation and can be run clockwise or counter clockwise. The EG is designed with an extended crank rotation, providing up to 192 degrees of rotation for optimal pump fillage. Both are supported with Liberty Lift’s component fabrication capabilities, so downtime isn’t a concern. Beam pumping units are the backbone of an artificial lift project, and Liberty Lift can build a strong backbone for all of its clients. Gas lift systems represent a powerful, all-round approach to artificial lift, and Liberty Lift designs, manufactures and maintains its systems, allowing for better cost effectiveness. Gas lift systems present few downsides to oil & gas companies, and to the well operators themselves. They are a primary choice in directional wells and in wells where accumulated solids are a concern. Those are the two major reasons, for example, that artificial gas lift is now the preferred choice for Permian Basin wells. Liberty Lift’s gas lift systems are designed and built to a complete degree, as they come with all necessary gas lift mandrels and valves for optimal function. Normally, artificial gas lift can represent a major investment, as the technology requires skilled people to maintain it. Liberty Lift’s responsive support team and ability to repair and replace fabricated components in the field means these costs are kept to a minimum. Our gas lift systems can be run in continuous or in intermittent modes, depending on how much field gas is available and what kind of bottomhole pressures are present in the well. In short, Liberty Lift’s gas lift technology is a versatile, easy to use option in most situations. Rod pump technology has largely held steady for decades, with one significant exception – the long stroke pump. Liberty Lift’s XL Long Stroke Unit is our version of this fairly young technology, and it brings an elite level of productivity and durability to artificial lift operations. Liberty Lift’s XL Long Stroke unit is capable of and extremely long 306-inch stroke length, which is nearly as long as it gets in the industry. This stroke length confer several benefits. For one, it increases fillage due to the rod’s slower travel time, and so better volumetric efficiency is achieved. Also, slower, more efficient cycles mean that fewer cycles are needed. This provides a major durability boost to bottomhole equipment and the rod string, both of which sustain significant wear with every cycle. This is particularly true of the bottomhole valves, which are a primary culprit when extraction operations have to be suspended. Liberty Lift goes a step further with its XL Long Stroke unit, as it is supported by our responsive and talented maintenance team. The XL Long Stroke is already a sturdy technology, but is made more so with Liberty Lift’s talented personnel. Liberty Lift is a leading designer, supplier and manufacturer of artificial lift systems, and our oil and natural gas lift technologies set the pace for the industry. But we’re more than just a lift system manufacturer, as Liberty Lift develops comprehensive, custom solutions for all of its clients. That includes maintaining Liberty Lift artificial lift systems following installation, and producing a full complement of components for those systems. Our support team and facilities are available throughout U.S. drilling zones and, at our facilities, Liberty Lift can fabricate and deliver components for most artificial lift systems, like gas lift mandrels and valves, for example. On top of our products and support services, we also work with other leading companies in the industry to help bring you the latest in cutting edge artificial lift systems. Our hydraulic jet pump was the result of this kind of mutually beneficial partnership. Together, Liberty Lift and JJ Tech have produced one of the most feature-rich hydraulic jet pump systems on the market. Hydraulic jet pump units are powerful pieces of technology, with the ability to function at extreme depths and with deviated wells. The artificial lift system consists of advanced surface and subsurface components and is available for either sale or lease through Liberty Lift. Backed by formidable Wanner Engineering, the skid-mounted surface system is built with a seal-less diaphragm design, allowing for better positive displacement and minimal downtime and maintenance. Liberty Lift and JJ Tech’s hydraulic jet lift system can be retrieved without a pulling unit, a workover rig or a wireline, and it operates beautifully when fraccing, as it manages high volumes of frac fluids without loss of efficiency. And it’s an easy to maintain technology as well, with on-site nozzle and throat repair capability. Additives mixed with the hydraulic fluid can also mitigate corrosion and paraffin, allowing for smoother operation. With remarkable performance capabilities, low maintenance and modern features, the Liberty Lift and JJ Tech hydraulic jet lift system is an efficient option for the most challenging extraction operations.